Digital Psychrometer is designed to take very accurate quick readings for all areas where accurate relative humidity, temperature, dew point, and wet bulb temperatures must be taken. 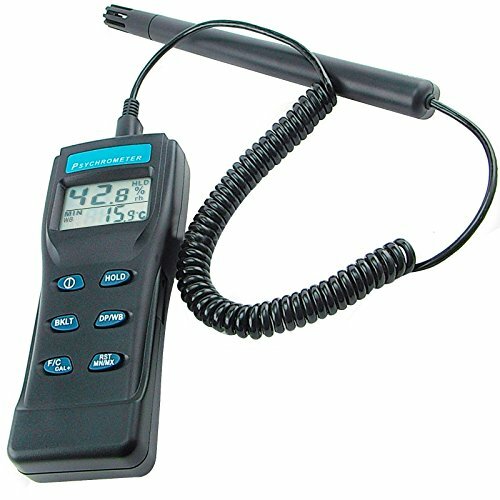 This thermo-hygrometer has a reliable built-in microprocessor circuitry and Dew Point & Wet bulb is calculated in seconds. It also has advanced functional features such as easy to self-calibrate by salt bottle, replaceable remote probe, maximum/minimum and reset function, hold function, backlight function, switchable °C & F, tripod mountable, auto power off that can be disabled anytime, low battery indicator and battery life that can last 50 to 100 hours. TWO-IN-ONE: combine the functions of humidity meter, temperature meter, wet bulb temperature and dew point temperature. Dew point is a measure of how much water vapor actually in the air. WIDELY USED: Used for HVAC, industry, agriculture, meteorology, medical, daily life, building engineer, paranormal investigator, in wine cellar, machine room, data storeroom and etc.